Why Does Chinese Alcohol Taste So Awful? China’s baijiu gets a bad rap for its powerful flavor, but it’s a wonderfully complex drink. Anyone fortunate enough to visit China and delight in its culinary gifts has surely encountered baijiu at some point. A mainstay of Chinese cuisine, it enjoys pride of place at nearly every social event — and if you’ve tried it, it’s unlikely you’ll ever forget it. I’ve actually seen people taste it and judder their heads with surprised disgust, as if hoping to shake the memory loose. Most of the expats I’ve known drink baijiu either as a matter of etiquette or as an inexpensive flight from sobriety. Few enjoy baijiu with the relish of a Portlander sipping her IPA or an Edinburger nose-deep in his Ardbeg Corryvreckan. As a baijiu enthusiast myself, I find this upsetting. Moutai comes by its astonishing complexity via a production process unlike anything I’ve seen in the West. Made mostly from sorghum and a little bit of wheat, it undergoes a fermentation process that includes the steaming of the sorghum, amassing it into a giant mound where it starts to ferment (like a compost heap), burying it in a pit for a month, pulling it out, distilling some of the alcohol out of it, and repeating this process seven times. Where the fermentation process for grain used in a batch of whiskey takes around a week, the process for Moutai runs over six months. After distillation, the spirit is aged in ceramic vessels for an average of five years. Why then hasn’t this incredible drink become an international favorite? In my experience, the problem tends to be a kind of consumer ethnocentrism whereby people imagine baijiu ought to resemble vodka, with a good one being clean and crisp and a bad one being razor hot. Judged by that standard, baijiu tastes like an intolerably bad alcohol. Though similar to vodka in clarity and strength (40-60 percent ABV), when making comparisons it’s best to cleave to baijiu’s closer cousin, Korean soju. I’ve written in detail about soju before, but for our purposes here it’s enough to know that this drink, once a Persian raisin brandy known as “dog sweat,” was made with rice until food shortages led to a ban on rice alcohol, and even today most soju is still made with sweet potatoes or tapioca, which impart significant heat. Newer brands are lighter, especially those marketed toward women, but the throat-warming heat of the old-school labels has always been well regarded. Similarly, the rich flow of esters characterizing baijiu are considered desirable. Western palates expecting something analogous to vodka will surely find the solvent kerosene aspect off-putting. Like a peaty whiskey, these flavors are densely layered and require patience. It’s an acquired taste, but to the initiated, deeply rewarding. Having accepted that baijiu isn’t a failed attempt at vodka, we should also keep in mind that a little money goes a long way and proper pairing makes a world of difference. Blue-collar types prefer ergoutou, a terrifically strong and amazingly cheap kind of baijiu, but you don’t have to spend much to get your hands on a bottle that’s truly special. Top shelf varieties include the Sichuanese Luzhou Laojiao, redolent of peach, the Taiwanese Kaoliang, featured in the classic film Red Sorghum, and of course, Moutai. Entry-level bottles of these brands cost $100 or less. Whatever you prefer, baijiu packs a punch and is best paired with food that can withstand it — Sichuan hot pot or the punishingly spicy Tibetan la phing. 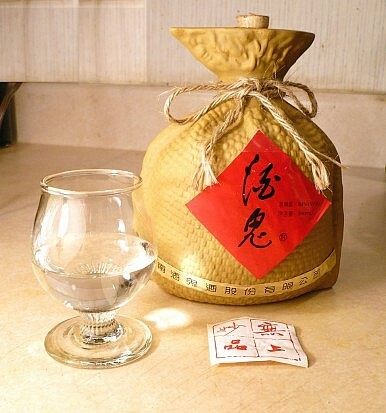 Interestingly, baijiu is grouped by smell, from the heady soy sauce notes of a jiangxiang or “sauce fragrance” to the tender smell of pears characteristic of a nongxiang or “concentrated fragrance,” like the famous Wuliangye of Sichuan. There are also flavored kinds such as the rose-infused meiguilujiu or roulaoshao, flavored with pork fat. Recently, China’s national spirit became “an ideal target” in Xi’s campaign against government excess, and the industry has suffered greatly since. Some experts think it has “nowhere to go but down.” Yet even as a shadow of its former self, its place in China remains as beautifully complex as its flavor. My friend Yuan Ming attended high school beside the old grey-bricked Wuliangye distillery in Chengdu. Now a museum, it no longer produces alcohol but after every rain, she says, it floods the narrow street with the smell of fermented pears, recalling her youth.